John Kotter is a professor at Harvard Business School, specializing in leadership and change. 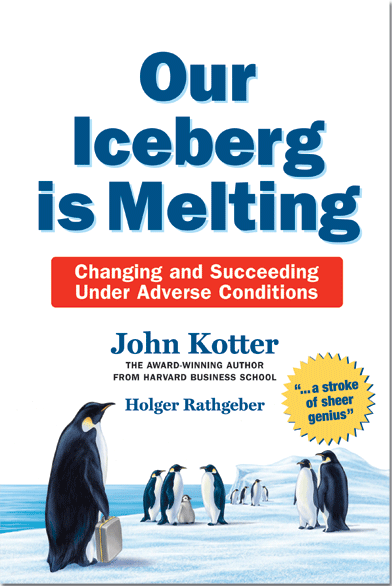 Our Iceberg is Melting is a fable in the vein of Who Moved Our Cheese (whose author, Spencer Johnson, wrote the forward for Kotter’s book), meant to illustrate Kotter’s eight-steps of effective change in businesses. Curious penguin Fred deduces that the iceberg on which his community of penguins live, is melting and in danger of breaking apart during the upcoming winter season. But what can he do about it? He’s not a scientific expert on ice melt, he is just observant. Why would any other penguins listen to him? Penguin Fred confides in a trusted official who has the ear of the penguin Mayor. But still, there is the challenge of convincing the rest of the penguin population that there is a problem and a need to change, especially when there are penguins invested in the status quo, who do not want change. Without giving away the entire plan, the basic idea is to continue to draw in those who see the need for change, give them tasks to enact the change, and let them be the ambassadors of the change. One wonders: if Jor-El had read this book, Krypton still would have exploded, but perhaps there would have been more survivors and we would have been spared the incredibly boring first twenty minutes of Man of Steel. At fewer than 150 pages, including several full-page penguin illustrations, Our Iceberg is Melting is a quick read (I read it in a single sitting over a Chipotle burrito). It shows that if you see the need for organizational change, whatever your role in your organization’s hierarchy, there is a role for you to play. I joined my company just over a year ago, at about the time that we began talking about the need for significant differences in the way we operate. I came in with no preconceived prejudices, but many of my colleagues have had difficulty digesting what their new roles and responsibilities might include. Our Iceberg is Melting gave me some things to consider to aid some of my colleagues through the inevitable change. Kotter, John and Rathgeber, Holger. Our Iceberg is Melting: Changing and Succeeding Under Any Conditions. New York: St. Martin’s Press, 2006. Print. Agree? Disagree? I am interested in your thoughts and opinions! Connect with me on LinkedIn and Twitter and let me know, or leave a comment below. You have a LinkedIn profile, you are adding connections, and are making professional status updates. Next, you will want to join and participate in Group discussions. There are groups for nearly every conceivable professional (and some not so professional) interest – school alumni, work current or former associates, professional affiliations, regional professional networking groups, and so on. If you cannot find a group to join based on your professional interest (unlikely), then start one of your own. Join groups to learn new methods and techniques to do your job better. If you are trying to figure out an answer to an issue for your client or company, check group discussions to see if our issue has been discussed. If not, then post a question and see who responds. Join groups to show your subject-matter expertise. Answer someone else’s question. Chances are, someone will agree, and someone will challenge. Go with it. Engage in a polite and professional discussion about the merits of your answer. Others are watching, and you are building your brand. Join groups to follow the discussions of someone you respect, or of someone for whom you might want to work. What is important to them? How do they talk about it? What do they reference? Join groups to gain access to group members. DO NOT SEND SPAM!! However, if you have been trying to get a phone number or email address for someone at a particular company, find out what groups they belong to. Join those groups. Now, you are allowed via LinkedIn to send them a message. But before you do, see what they are talking about in the group (point 2), and if you have time, begin to set yourself up as a subject matter expert (point 2), to increase your chances that they will respond when you do reach out. Thoughts? Comments? Connect with me on LinkedIn and Twitter, or leave a comment below. A LinkedIn invitation request: nailed it! It was great to meet you at the NETPA meeting on Friday. Thank you for your valuable insight and advice. I’d love to know more about your incredible work to empower people through CASS’ programs. Let’s stay in touch! She personalized it. She did not use the awful generic request. She reminded me how we met. We actually met at a networking event. She told me she is currently in transition, she told me what she is looking for which – while we did not discuss – when she is successful, she will be in a position to aid me and some of my clients. She gave me her business card which detailed three related tasks that converge to her ideal position, two lines of expertise, and contact information on the front and back (excellent touch!). I followed up with her via email with a couple of leads I thought might help her, and she responded by reaching out to connect via LinkedIn. Still, she did not assume that I would remember her. Maybe my leads won’t pan out, or maybe she will decide to not follow through. But, she was gracious. She stroked my ego a bit. Because really, everybody likes to hear good things about themselves, and we are all mote likely to respond well when we do. She did not try to sell me anything, or ask me to do anything other than connect, and stay in touch. Because this invitation request was so well executed, I readily accepted. And, even though the opportunity she seeks is outside what any of my clients are looking for, I am going to keep my eyes open and if/when I see something that might be a good match for her, I will happily share it. I think my invitation requests are pretty good. She nailed it, and this is going to be my model. Connect with me on LinkedIn, or Twitter. You have a solid LinkedIn profile, and you are making connections. But remember, the purpose of LinkedIn is to help manage your career. Having a well-crafted and informative profile, and having a lot of influential connections, are only parts of the equation. The other necessary component is to promote yourself as a subject-matter expert. LinkedIn makes it easy by allowing Status Updates. 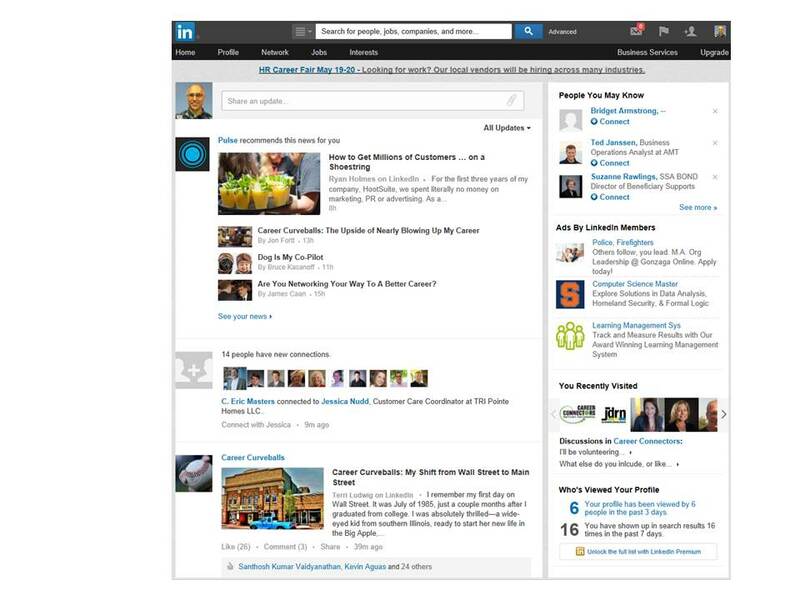 LinkedIn does some of the work for you by posting an update when you have a new connection, or when you revise your profile to who a promotion or a new job, or have a work anniversary or birthday. But these are rather passive. You want to show your connections that you are engaged in your profession and have something substantive to say. LinkedIn is not Facebook, so do not post about your meal (unless, possibly, you are a chef or a food critic) or about how angry you are over the finale of “Lost” (I mean, seriously, what was up with that?). So wait, the island was what, exactly? And LinkedIn is not Twitter, so you do not need to make multiple posts per day. Note that LinkedIn, and LinkedIn users, frown on overt sales pitches. But posting a Status Update (if your company’s rules on social media use allows) about your company’s sponsorship of an event might be very appropriate. Self-promotion – talking about our achievements – is much easier for some than for others. But doing so is essential for effective job search, and long-term career management. And over time, it gets easier. How do you use the Update Status section on LinkedIn? Please share in the comments below. The power of LinkedIn is in growing your network, not necessarily with the most number of connections, but with the right connections to help you advance your career. – Simply people you meet at an event and with whom you want to stay in touch. LinkedIn makes it easy to connect with everyone in your online address book. DO NOT USE THIS FEATURE. This is an ineffective way to connect, since everyone will get the same generic invitation request. Instead, I suggest you personalize every request. When I receive a connection request from someone I do not know and they use the generic “personal note,” I assume the person does not really care about me; they are just trying to randomly grow their network. I usually ignore these requests. 1. Go to the person’s profile. Read it. Note if you share any commonalities. 2. Click the “Connect” button. 3. How do you know this person? If none apply, use the “We’ve done business together” option. – Unless you live or work next to this person, do not assume that they remember you. Remind them how you know each other (if you do). – Why do you want to connect? – What value do you expect to receive? – More importantly, what value can you give? Perhaps reference something from their profile. If you want to connect with me, tell me why. With just this simple effort, I am usually more than happy to accept. As you build your LinkedIn network, you add those who you believe can connect you to Someone Really Important for your career. Believe it or not, you are the Someone Really Important to someone else, with whom others will want to connect. There are generally four strategies for how LinkedIn users manage their connection requests. You do not need to be a strict adherent to any one of these strategies, but you should put some thought into how you want to grow your network. Strategy 1: Connect with low-active users you know. These users tend to have the barest minimum of a profile and only a handful of connections. If you know the person well, perhaps you pay it forward, connect with them, and help them improve their profile. Strategy 2: Follow the rules. LinkedIn encourages users to connect with only those you know in real life, who know you well enough to Recommend or Endorse you. This is a sensible way to begin growing your network. Eventually, though, you will get a request to connect with someone you don’t know (because you are their Someone Really Important!). Whether you accept that request or not will depend on your willingness to adopt another strategy. Strategy 3: Become a LinkedIn Open Networker (LION), accepting any and every request in an attempt to grow your network as large as possible. LIONs believe that by increasing their first-degree connections, they greatly increase the likelihood that a second-degree connection is the Someone Really Important that they want to meet. The challenge is, because the real-world relationship with many of the first-degree connections is low or non-existent, getting to the second-degree connection they want is still essentially a cold-call. You may decide this is a good strategy for yourself. Still, I suggest that you start out more conservatively until you can see how your network works for you. Strategy 4: Selectively increase your network. Perhaps you accept a request from someone you don’t know (yet) because they are doing what you want to do, or because they work for a company in which you are interested, or because they simply wrote a compelling connection request. Or you may decide to ignore the request. Whether you decide to accept or ignore the request is up to you. But if you decide No, then simply ignore the request. Do not send a note explaining why. Chances are they simply did not have a good strategy for requesting a connection – which you will, after you read my next post. In an earlier post, I talked about the five basics for a solid LinkedIn profile. There are still other sections to which many LinkedIn users give little attention. By completing these sections, you increase the likelihood of your profile getting noticed. The ability for anyone who knows you to write a recommendation is one of the best features of LinkedIn. The best ways to get a recommendation is to ask for one (they will need their own LinkedIn profile to link to yours), or even better, by writing a recommendation for someone else. You are allowed to include up to 50 skills, for your connections to “endorse” you. Some social media experts question the value of Endorsements because it is easy for anyone click a link. However, LinkedIn is committed to Endorsements, and between two otherwise equally qualified profiles, the one with the more Endorsements will rank higher on a search, and is therefore more likely to be noticed. Include your professional awards or recognition, and any professional organizations or associations you belong to. On resumes, I typically recommend you do not include dates of your education. Include education dates on your professional profile, however, because it allows you to find and connect with classmates during and around your years in school. Certainly, include all degrees earned and any additional coursework that supports your professional goals. I am a huge advocate of volunteering. If your volunteer experience is relevant to your profession, then I suggest including it in the Experience section; you gained relevant skills. Otherwise, include volunteer experience here, to show that you are a well-rounded person. The “Causes You Care About” and “Organizations You Support” sections have pre-filled pull-down menus. Completing these sections again show that you are well-rounded. Social Media experts agree that you should include Interests, but they differ on how. Some say you should include your personal hobbies, as a way to showcase your personality and as a hook for potential connections (“You like long-distance running? So do I!”). Others suggest this is another area to include key words for your professional branding, to benefit search engine optimization. I choose to include my hobbies, though I do not have a strong opinion either way. In a future post, I will give more suggestions about how to optimize your profile.